“The house perched in the center of a sloping hill ringed by the wet woods. Its looming tower columns and lead-paned windows gave off the haughty air of wealth fallen to ruin. The paint of the intricate gingerbread facade, tracing the awnings in delicate loops and curls, peeled with age. The once robin’s egg blue walls now faded to a dull gray. A layer of grime coated each window, obscuring the view of the furniture inside. Chaise lounges and lion footed clocks transformed into dusty ghosts and goblins under their off-white sheets. Many summers came and went without anyone to care for the sprawling lawn or surrounding gardens. Each spring the forest swallowed a little more of the yard. Even the once-gleaming copper spires adorning the tower tops were tarnished with green speckles; only their points remained visible above the boughs of the massive pine trees. 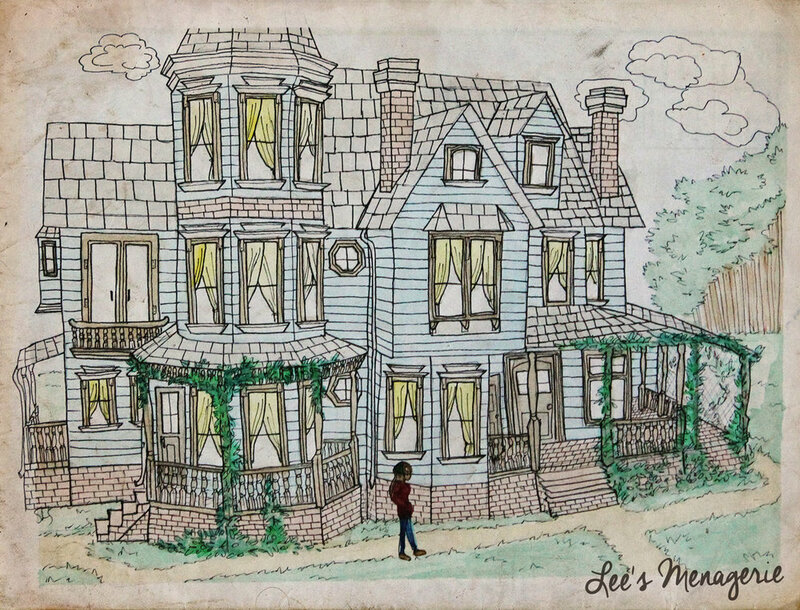 That house on the hill will eventually become the home of The Lee’s Menagerie, a gateway between two dimensions where the Lee family has made researching and caring for faerie creatures their mission. But the journey from abandoned house to faerie rescue headquarters was a long and interesting one. In fact, the Lee family wasn’t even aware of the existence of another world when thy moved into the Menagerie house! The full story of the how the Menagerie became what we know it as today is currently being written as a novel trilogy. Hopefully the first book will be available for purchase in 2020, however, life circumstances have pushed the release date back on several occasions. Until the first full novel is available however, we will be adding information about the story behind the Lee’s and some of the key characters in it into this section of the website. I know many of you have been waiting a very long time for the story to finally be released, and we appreciate you sticking with us for so long! Hopefully providing some further exploration into the Menagerie world will tide you over until we are finally able to get a copy of our book into your eager hands.